Improve the appearance of your home or place of business with our vinyl flooring installation service. When you find yourself ready to upgrade your floors, let our skilled and experienced crew get to work! We provide a wide range of choices for your vinyl flooring needs, and our friendly staff is ready to answer any questions you might have about our installation services. Pick the best pattern, color, and style to match your home décor, and we’ll install it quickly, efficiently, and affordably. Have you made the decision to change the floors in your place? Put your trust in our honest and dependable sales and installation team. At our company, we have many years of experience in the flooring industry, and we design, sell, and install high-quality vinyl floors for our loyal customers. Let us give you a hand with your flooring needs today! Looking for Vinyl Tile Installation Services? Visit Us Today! 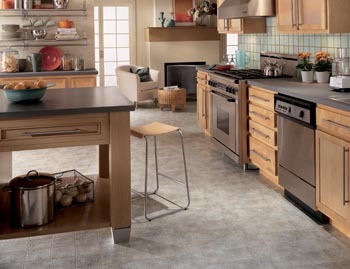 Once you visit our spacious showroom, you’ll understand why we are the area’s leading provider of vinyl tile. In addition, complete installation after the sale is one of our specialties. So make sure to take advantage of this service. Why waste your weekend and your money on specialized tools by doing the work yourself. Let our professionals handle the heavy lifting for you. As reliable and professional vinyl floor installers, we ensure that your floor is properly installed and amazingly beautiful in a short time. Best of all, we work around your busy schedule. That way our vinyl tile installation service never impacts your home or office routine any more than necessary. Find all of the vinyl flooring services you need in one place at our flooring superstore. From designing custom vinyl flooring plans for your bathroom to installing new vinyl tile for the kitchen in your home, we have something for everyone at our flooring company. Choose from a large selection of patterns, colors, textures, and styles. We’ll also provide examples and guidance to help you narrow down your choices. Once you have found the best match, we are more than happy to install your new vinyl flooring. Contact us today when you want more information about our custom vinyl flooring options. We install quality vinyl floors in homes and businesses throughout Akron, Cuyahoga Falls, Stow, Hudson, and Fairlawn, Ohio, as well as the surrounding areas.